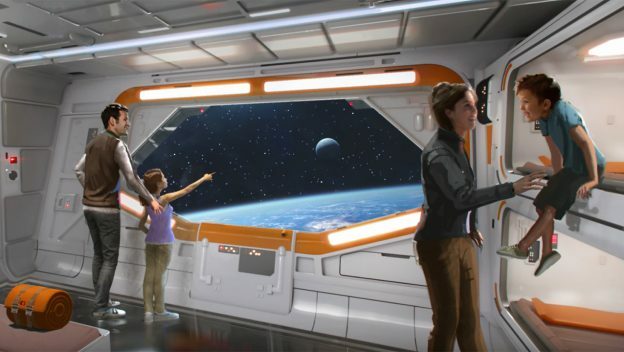 Disney has released more information about the new Star Wars hotel that will be located adjacent to Star Wars: Galaxy’s Edge at Disney’s Hollywood Studios. Guests visiting the immersive hotel will board a starship that is “alive with characters and stories” that will play out during their stay. And, all the windows of the hotel will look out into “space” – not the Orlando sunshine! Guests can also dress in Star Wars costumes to really participate as residents of the galaxy. And, as we mentioned the hotel will be “seamlessly connected” to Star Wars: Galaxy’s Edge, making it unlike any other hotel at Walt Disney World Resort. You can check out a video about the hotel here.